CIT - Cork Institute of Technology - What is energy engineering? Sustainable Energy Engineering involves the understanding and application of the engineering and technological principles of energy conversion and use. WHAT IS SUSTAINABLE ENERGY ENGINEERING? Sustainable Energy Engineering involves the understanding and application of the engineering and technological principles of energy conversion and use. The first two years of the course introduce and develop the fundamental components of engineering, and modules in electrical, mechanical and chemical engineering are included along with specialist energy and sustainability modules. The third and fourth years extend the specialist nature of the course, with more emphasis on systems control, programming, group product design projects and modelling, along with specific energy and management topics. All groups also enter the CIT prize for Innovation Competition. Sustainability requires that the proposed energy solutions are truly viable into the future and that the impact on resources, the environment and society as a whole are minimised. The need to “de-carbonise” our energy supply is fundamental to achieving this goal and decreasing dependence on imported energy. Modules are delivered by staff from many different disciplines, allowing the student to gain understanding of the roles of a range of engineering disciplines involved in the energy and sustainability field. Sites visits are organised which have included: wind farms, hydroelectric power stations, and solar installations. Visiting speakers provide industry input to the programme and have included GSK, Phillips 66, OpenHydro, Arups, Kingspan, Stryker, and Abbotts. Most of these companies now employ graduates from the programme. A major individual research project is undertaken by each student in the final year. In most cases, this project has been brought back from the work placement and has real industry relevance. The results of the project are presented to the public and industry at the annual CIT Engineering Exhibition in April. Some of the Final Year projects will be based on the CIT ZERO2020 Building Project (www.zero2020energy.com) which aims to have net zero energy use once fully retrofitted with a new low energy façade and 25kW of solar photovoltaics linked to a 2kW wind turbine. 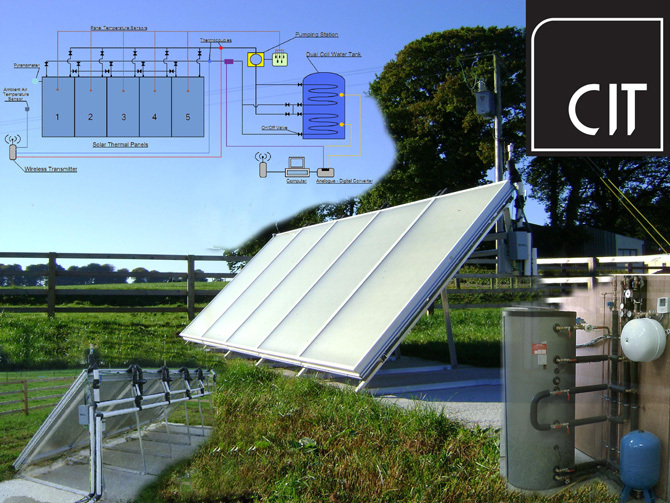 Other Final Year projects will be based on the €1 million NSBET microgrid project (National Sustainable Building Energy Testbed) (http://nimbus.cit.ie/tec) a collaboration between CIT and UTRC which provides a micro heat and power grid to the Nimbus Research Building, and allows research on smart grids, supply and demand side energy management technologies, and new product research and development. CIT launched a new Research Strand in Energy and a new Energy Research Coordinator has been appointed to coordinate research across the Institute. The assessment methods will include examinations, short tests, written assignments, oral presentations, individual and group project work, team building and problem solving, exhibition presentations to peer groups and the general public, and work placement performance. The student will be assigned a lecturer to act as an academic advisor and mentor, to assist the student in module selection, and work placement, as well as to assist in academic endeavours. The numbers of students in each class group is generally small, allowing the students to have easy access to the lecturing staff. Good support mechanisms for students are provided, e.g. extra free tuition in core subjects (e.g. mathematics and physics). There is a mandatory work placement module for a minimum of 10 weeks at the end of the third year, however, in most instances the company will extend this over the summer upto 6 months in total. The student will be placed in an energy related industry, consultancy, government agency (SEAI), or research group. The placement will be assessed by means of presentations, reports and research project development. There are opportunities for students to spend this period abroad on a European exchange. This programme is accredited at undergraduate level by the Energy Institute http://www.energyinst.org which enables graduates to progress towards Chartered Engineer. Honours graduates are eligible to apply for a postgraduate degree at Masters and PhD level, either at CIT or at other Irish and overseas colleges. A Masters in Energy Information Systems is currently being developed in CIT. Is there a shortage of graduates in the Sustainable Energy field? Yes. Globally there is shortage of Engineers who specialise in Energy Engineering. What kinds of Energy Systems are available at CIT? What are the most helpful Leaving Certificate subjects for this course? • Physics, Engineering, Construction Studies, Design and Communication Graphics, and Applied Mathematics. If I am not doing any of the recommended subjects in the Leaving Certificate, can I still apply for this course? • Yes, the core fundamentals are delivered in Year 1 and we assume that students have not taken these subjects. What standard of Mathematics is required for the course? • Minimum B3 at Ordinary or Pass at Higher Level is recommended. Some students who apply to CIT courses may not achieve the required entry standard in Mathematics through the Leaving Certificate. For such applicants, CIT offers a second chance to reach the required entry standard through a CIT Mathematics Exam. Is there work placement in Ireland or abroad during the course? • There is a mandatory work placement module for a minimum of 10 weeks at the end of the third year. The student will be placed in an energy related industry, consultancy, government agency (SEAI), or research group. The placement will be assessed by means of presentations, reports and research project development. There are opportunities for students to spend this period abroad on a European exchange. Is there any professional body accreditation of the course? • This programme is accredited at undergraduate level by the Energy Institute http://www.energyinst.org which enables graduates to progress towards Chartered Engineer. Graduates have also been admitted as full members of Engineers Ireland and may use the title MIEI, following individual applications to the Institute.